As promised…here is a picture of the before hutch. Forgot to take pic until DH drug the darn thing outside. Still thinking of removing the small lamps to make more room for white china or stacks of books? BTW Only the bowls started out white. I had a very mismatched collection of glass wear, pottery and platters. Thanks to can of lovely crisp white spray paint…everything matches!!!! Got the inpiration for Flea Market Decorating Magazine. How’s that for thrifting????? 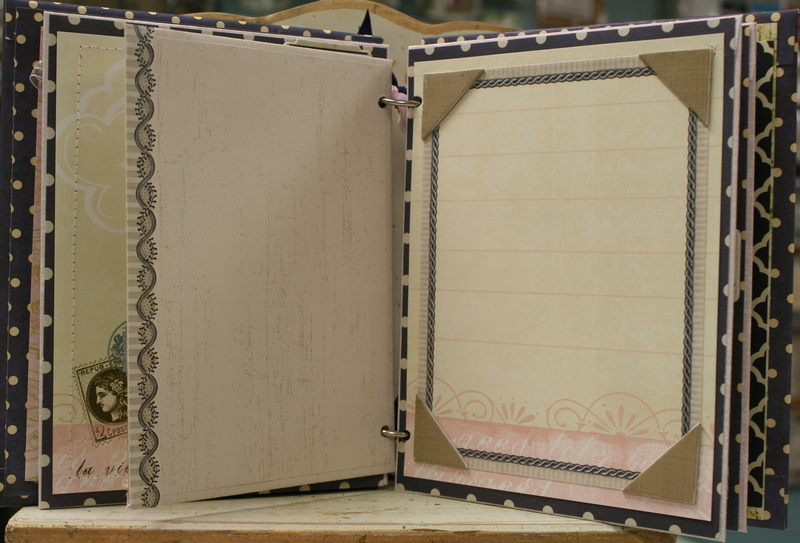 This sweet and sassy little number is a hard cover notebook! 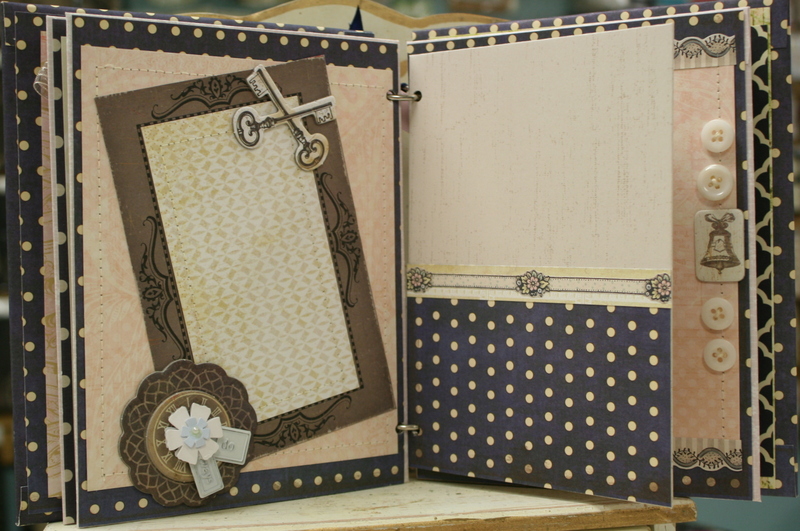 The paper from GCD Studios covers hard book board and forms the base for all the vintagy layers. I used a pretty frame sticker from Webster’s Pages and added an awesome scroll image from Graphics Fairy to the top and bottom. 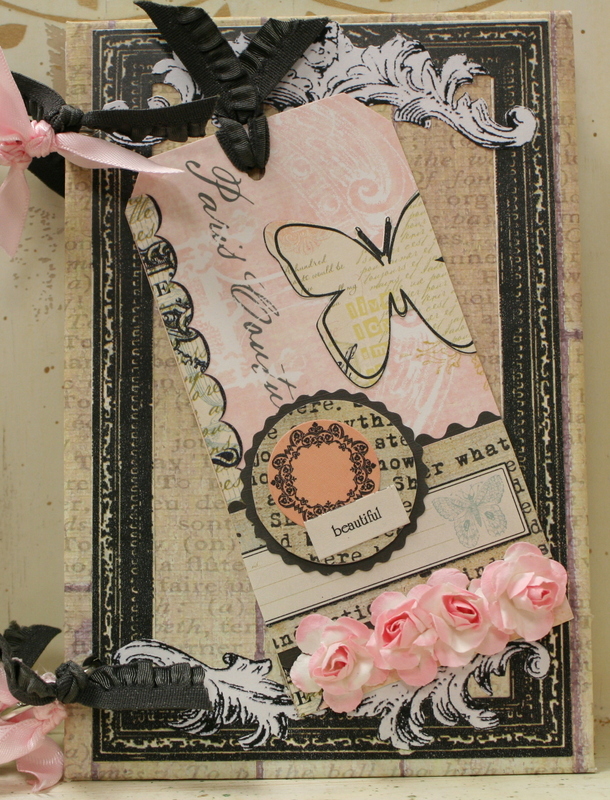 next the stylishly dressed tag with ” Paris Coture”, typography butterfly, and really beautiful dimensional roses. I like to wrap the paper around so there’s no unfinished edges. As many of you know…we are in the midst of a remodel here. New windows, new paint and all that fun stuff. I figured as long as I have to repaint…I may as well take the opportunity to change up the decor as well. So it’s out with what I refer to as Early Traditional Best Buy decorating plan that consists mostly of a giant flat screen and giant couch preferred by the other members of my household….all male, and two teens. My new decor theme is Pottery Barn meets shabby chic. Here is the first installment of new and improved plate rack in the kitchen. The plaques are actually dollar store particle board squares that previously had french country roosters in golds and reds. The new images are of course from Graphics Fairy!!! 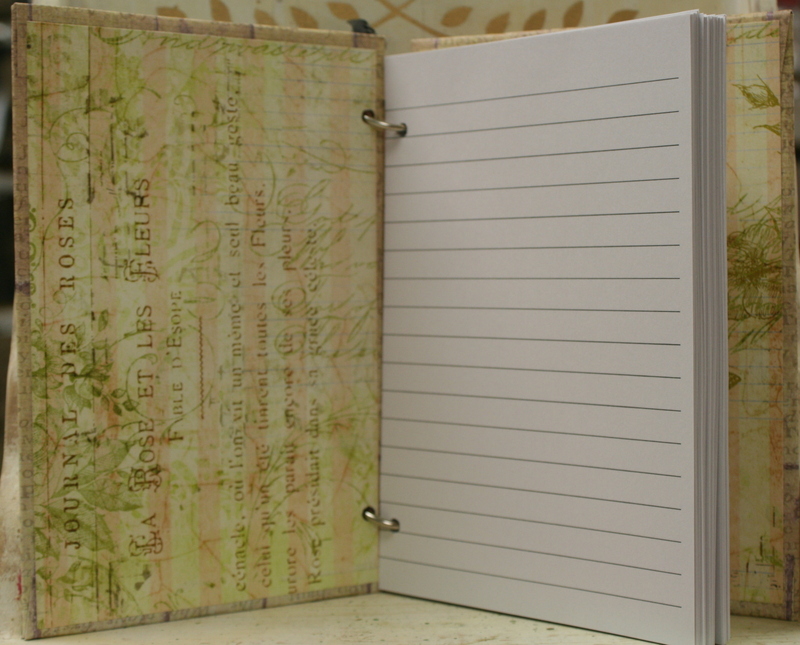 Lot’s of layers of papers and all wrapped so no unfinished edges! Sorry about the dark picture….the suns not quite up yet here. Wedding Book and more Shinies!!!!! See…told ya I could sew. Straight lines even!!!!! 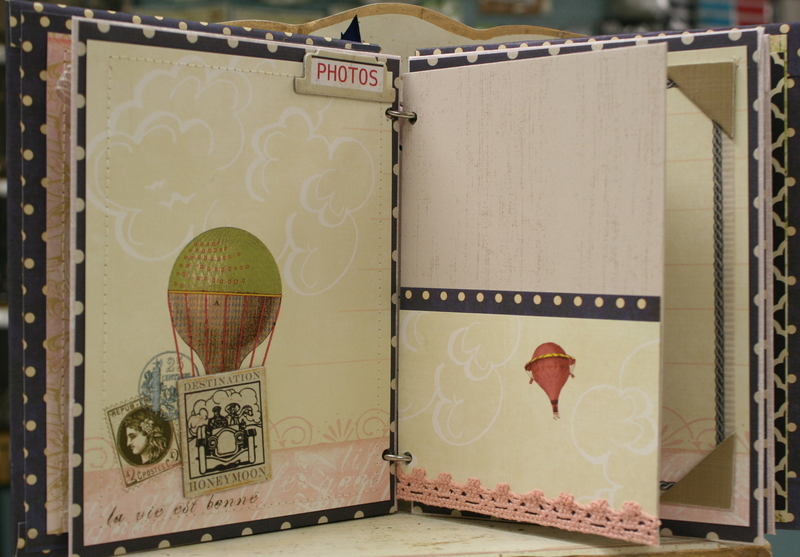 The page on the right has a pocket to tuck in extra pictures or mementos from the honeymoon. 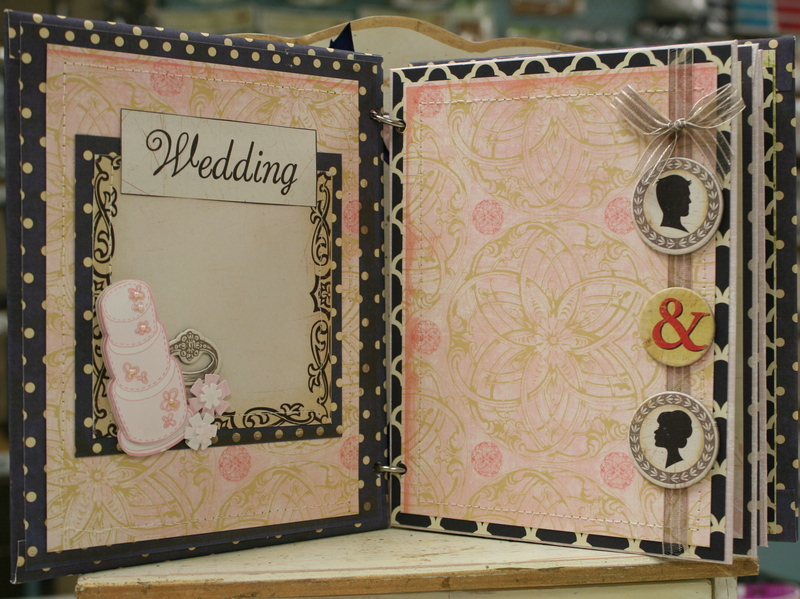 Had some fun layering the chipboard pieces here. You know I can’t resist the buttons. 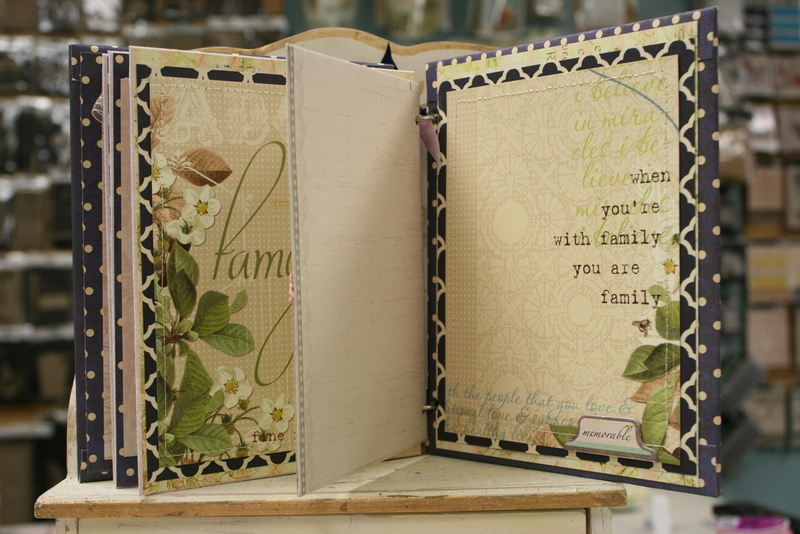 Pages for he family. One more pocket. Susan really liked the saying on the right side page. I couldn’t agree more! Okay….here’s the disclaimer….I do know that shinies is not a real word. But every time you see something glittery don’t you say ” ooooooo shiny” ? Thought so!!!! That’s a big chunky chipboard piece that has hand applied silver glass glitter. Yay!!! Then I strung it on a nice long piece of mocha colored ribbon. 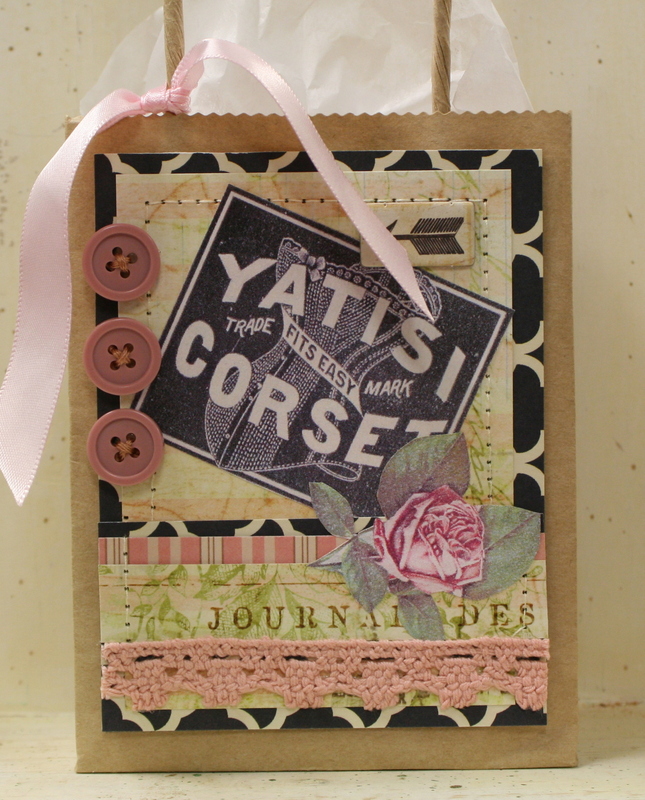 I put two tags on, one with a beautiful image from Graphics Fairy. Good things do come in small sizes. 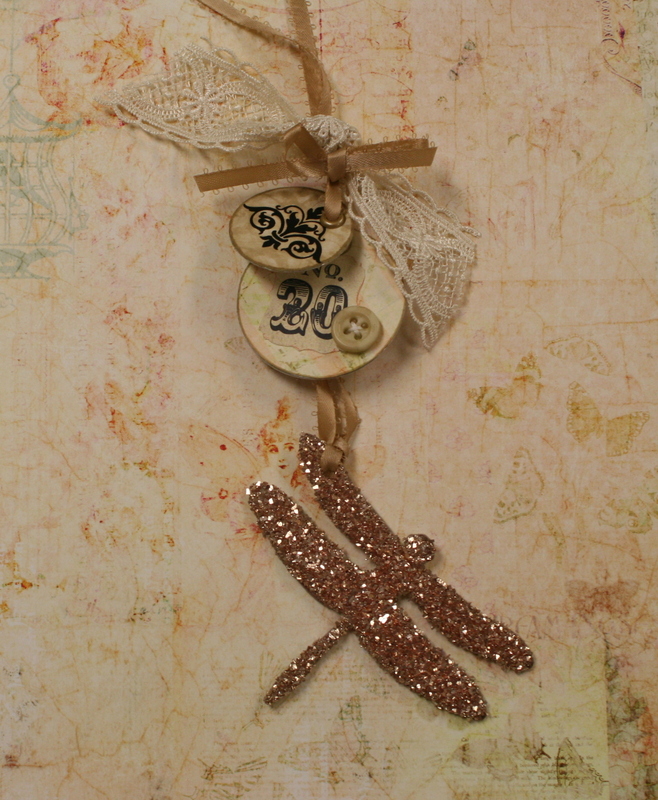 The next tag has a pretty vintage inspired number image and mocha colored button with string. A nice length of pale, creamy lace is the finishing touch! LOVE IT!!! 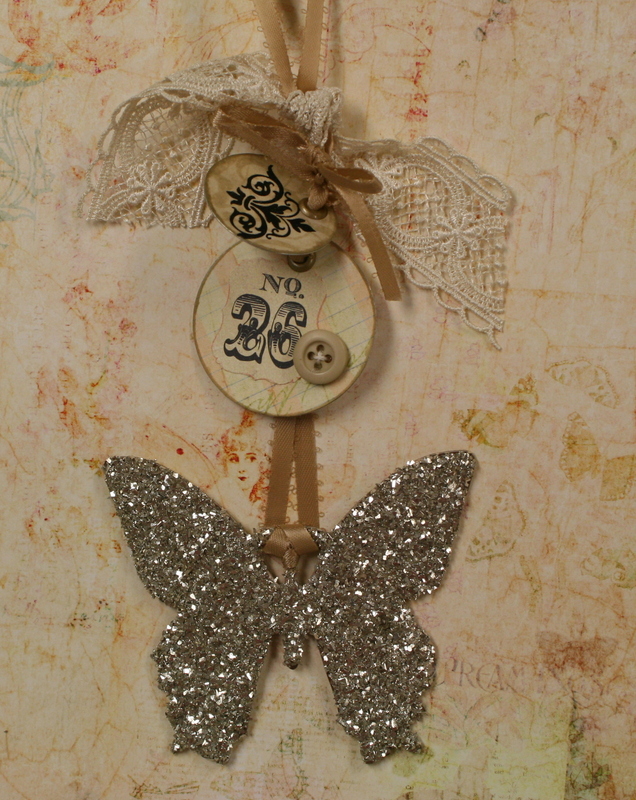 This one is similar….but has a coppery glass glitter covered dragonfly. LOVE IT TOO!!!! Just popping in to share these sweet gift bags. 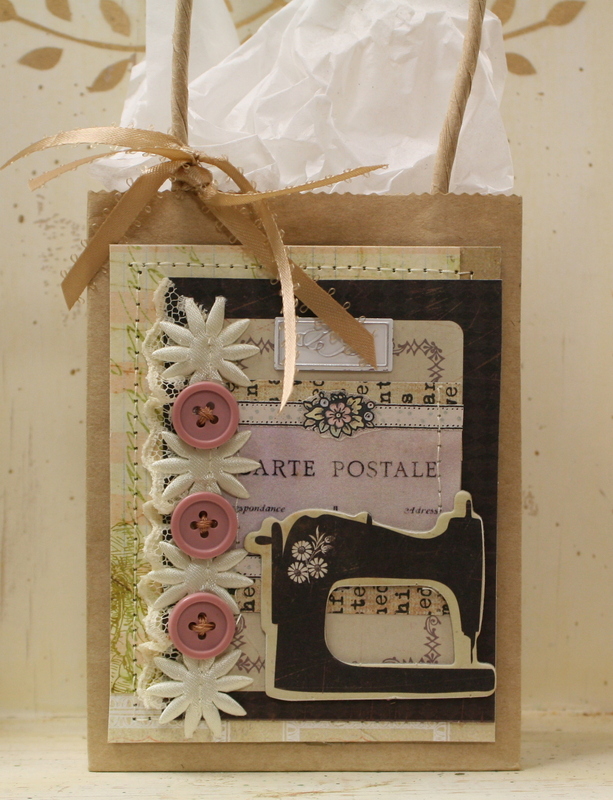 They started out as simple craft paper bags with handles….then I worked some vintage magic on them : ) There are a ton of layers on these little cuties and some wonderful images from Graphics Fairy. 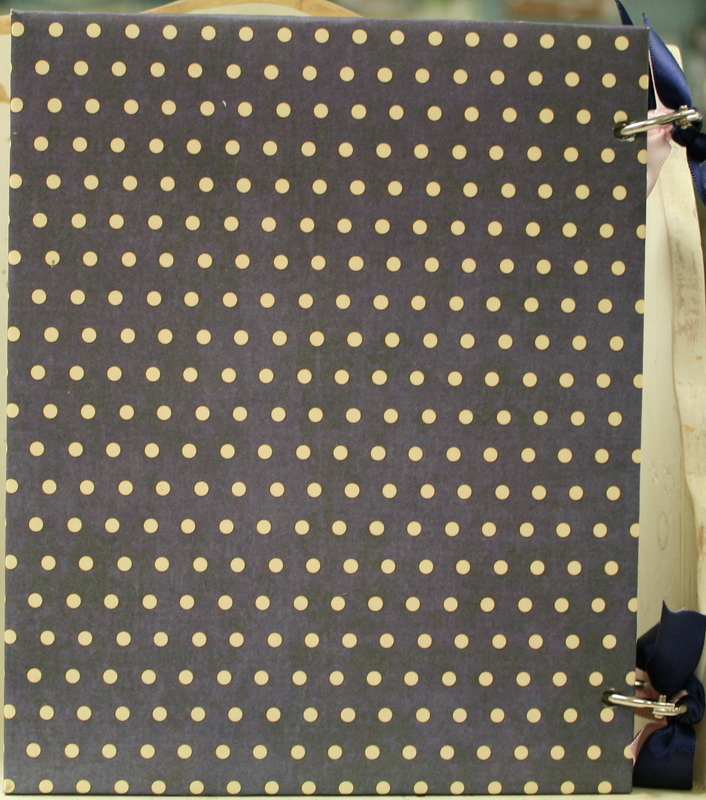 I also added a very generous amount of trim, and of course buttons! 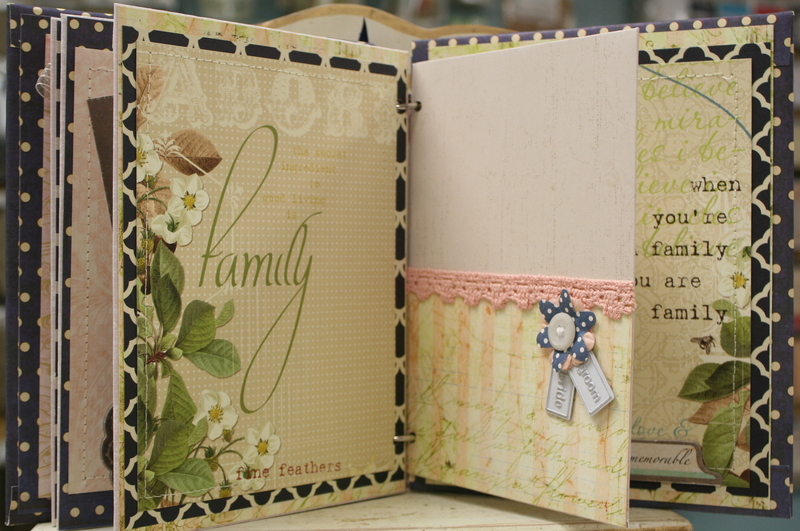 These would look great displayed on a shelf in a craft room too I think! Continuing my gradual descent into the world of vintage and shabby chic I find that I can not-I repeat-can not resist lace and trim. It must go on everything!!! I made up these tasty trim tags yesterday with lot’s of trim and tags that can be reused! 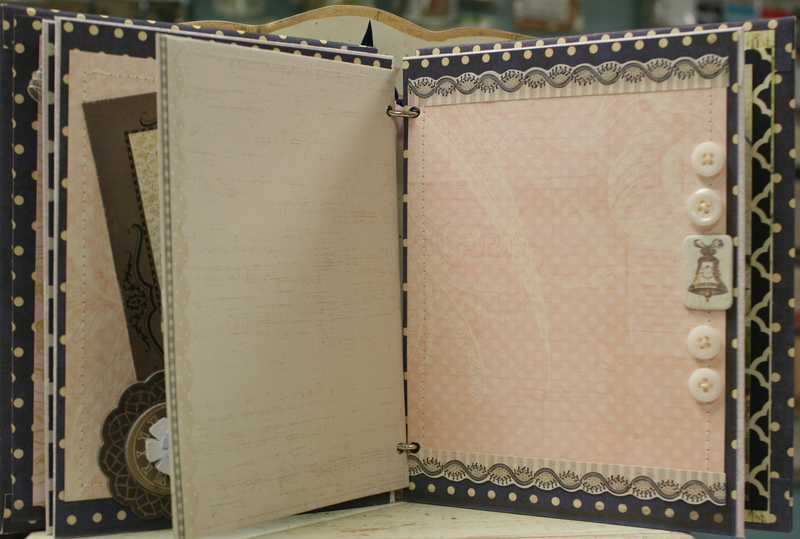 These trims are in dreamy pale shades and come in 1 yard lengths, so there’s 4 yards of lace trim and 5 tags. The tags on the binder rings are actually mailing tags with a metal ring, fun vintage number and button with string. The other tags are a double layer so they’re extra sturdy. Saving the best for last!!!! Mailing tags with beautiful paper, vintage numbers, ribbon, lace, and lovely little crown embellishments. 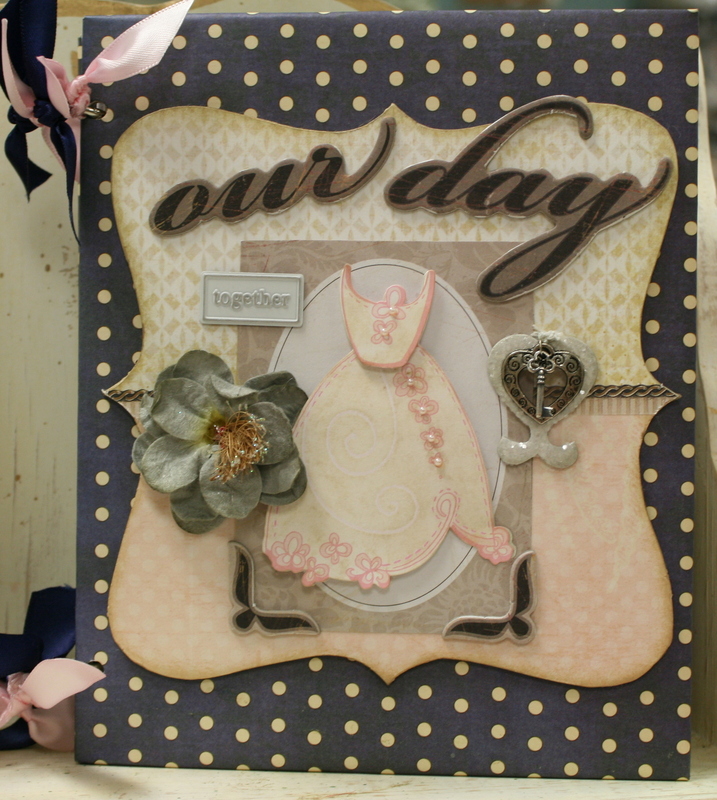 Swoon now or forever hold your peace!